Yet more evidence has surfaced of this weasel’s pro-Trump proclivities. Something tells me this won’t be the last damning revelation, either. It’s long had a tradition, under many presidents, of operating outside constitutional norms. It routinely violates the Fourth Amendment. Unlike most labor unions, the union representing ICE agents is a right-wing organization that endorsed Trump in the 2016 election. ICE agents have deliberately ignored court orders when the courts rule against Trump regime policies. People get tortured to death in ICE detention. It’s entirely in character for such an agency to provoke a confrontation for political purposes. In fact, the thesis that they did is the simplest and most consistent one going. Per Occam’s razor, it is the one we should assume is true, until and unless facts contradicting it come to light. I don’t think I’ve ever related it here on the Web, and I’m a little short of current events to comment on at the moment, so I think I’ll relate how I began deprogramming myself from the pro-Establishment propaganda that I, like all individuals growing up in our society, was subjected to as a child. It happened in my early- to mid-teens. This was well before the Internet had made it possible for anyone to easily seek out alternatives to the pro-Establishment mainstream media. Radio had always fascinated me, and as luck would have it that had led to an interest in shortwave radio. At the time, shortwave was the only practical means of affordably distributing audio programming worldwide, so there was no shortage of foreign broadcasters beaming their angle on world events, in English, to the USA. All one needed was a shortwave receiver and some knowledge how to use it (it was not as simple as tuning in domestic broadcast stations, though it was not particularly difficult, either). Many of the broadcasters transmitted what was basically state propaganda. It was quite obvious: the governments in those countries were always uncontroversial, always doing only good things, and always with widespread popular support. According to their own state media, of course. That got me thinking as to how, if I had been unfortunate enough to be born into one of those unfree societies, I might manage to detect and compensate for my indoctrination, assuming I was equipped with a shortwave receiver. The answer I came up with was based on my observations of individuals around me: they were not all equally honest and moral. Some would tend to tell the truth even if it put them at a disadvantage. Those same individuals also tended to treat others with the most respect. Others tended to lie more often, and the liars typically treated others poorly. It seemed reasonable to presume that these same overall traits could color entire societies and their governments as well. Therefore, it would be possible to identify the more credible sources of information on shortwave: they would be the ones that admitted self-criticism onto their airwaves. They would be the stations that sometimes admitted painful truths that were inconvenient to their own nations’ governments. So after a period of introductory listening, one would be able to compile a mental list of information sources, ranked by their evident credibility. Further accuracy could then be achieved by listening to news from as many sources as possible, and comparing the reports for consistency, taking into consideration each source’s estimated reliability and the fact that there’s always a disinclination to report things embarrassing to one’s own side. I then filed that away as an interesting thought experiment and didn’t think much more about it for several months, until I noticed a first sign that indoctrination and suppression of inconvenient facts was present in my own society. Maybe it was Radio Australia occasionally mentioning genocide in East Timor being committed by Indonesia, a US (and Australian) ally. That claim later got corroborated by a BBC report. Both sources had been judged credible per the above criteria; plus, the stories aired by Radio Australia were directly inconvenient to their own government. Evidently the line I had been fed about how human rights was the prime motive behind US foreign policy was incorrect. If so, something else must be the prime motive. Maybe it was the program on Austrian history on Radio Austria International (another source judged reliable) which mentioned how the USSR had occupied Austria and turned it into one of their satellite states for a few years. Then Stalin had been talked out of it and agreed to let Austria basically go its own way, provided that it promised to not take sides in the Cold War. Wait! I had always been told that communism was permanent, and that no country that had “gone communist” had ever gone back. That was how the more extreme Cold War measures were typically sold, and here was evidence that the selling point was itself a lie. Or perhaps it was one of many news reports from a Western European source which indicated that the nations of Western Europe had significantly more generous welfare states than the USA did. Evidently the line that the USA was almost maxed out on how much social spending a society could sustain without collapsing was incorrect as well. And then there was the little matter that the nationalized broadcasters in Australia, the UK, and many other countries actually seemed to be doing a better job at reporting the news than the capitalist ones at home in the USA. Weren’t nationalized enterprises inevitably supposed to be less efficient than private ones? Yet another lie that I had been told had just been detected. Whichever was the first sign, others quickly came. The die was now firmly cast: I knew that propaganda was very much a part of my own society and that it had to be watched out for and compensated for. The baseless accusations against the counting (and, in Florida, recounting) is already well underway. Now Trump himself is getting in on the game. I told you so, and it’s probably only going to escalate. Part of it is going to unfortunately help distract from (and establish a false equivalence with) the place where there almost certainly has been an actual fraudulent election: Georgia. This is unfortunate, as there is no equivalence between bogus election fraud and actual election fraud. I certainly hope Stacey Abrams realizes this and refuses to give a standard concession speech to Brian Kemp. By choosing to use his role as Secretary of State to compromise the election, Kemp forefit any entitlement to a gracious concession from his opponent. This is initially what caught my attention. One almost never sees such agreement. If a Never Trump conservative offers unsolicited advice to the Democrats, it is virtually always of the “concern troll” variety, reminding the Democrats that they must triangulate rightward to be politically viable. And, of course, those of us on the left advise the Democrats to move leftward. Of course we both do. If you are an activist, of whatever stripe, you want the world to move in your direction. There’s nothing inherently wrong with this; in fact, a huge amount of human progress has happened because of activists and revolutionaries trying to move (and eventually succeeding at moving) society in a new and better direction. Also just elected Republicans to the statewide offices of Auditor, Secretary of State, Attorney General, and Treasurer. In other words, all Ohio statewide races, other than the one Brown ran in, this year were won by Republicans. By pretty much all measures I’ve managed to take, he’s on the left of his party. He opposed corporate globalization during the Clinton Era, and he’s continued to oppose trade deals that shaft the working class. He opposed the repeal of the Glass-Steagall Act. He opposed the Iraq War. He’s stuck his neck out in support of LGBT rights (he opposed the Defense of Marriage Act in 1996). Some months ago, I claimed here that Sanders could have won the 2016 presidential election. I based that claim, not on the assertion that the majority of American voters are leftists, but on the assertion that a huge swath of them are not centrists but rather nonideological pragmatists who are open to persuasion from a broad swath of the political spectrum. And lo, it turns out that the most successful endorser of candidates this election cycle was none other than Bernie Sanders! 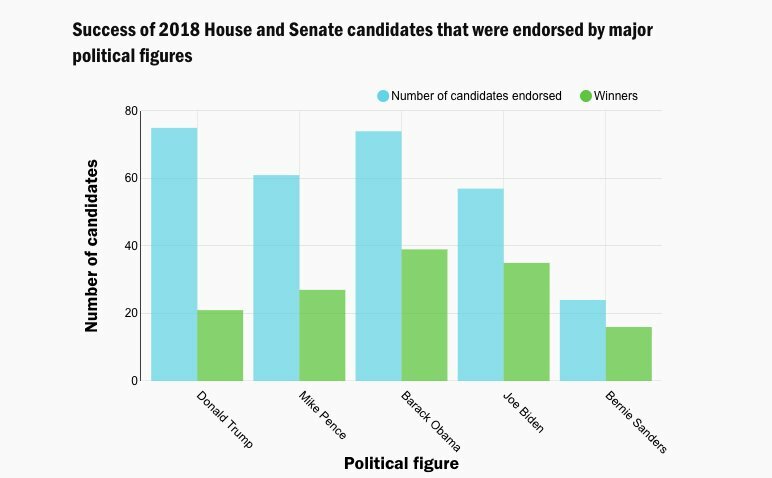 A larger fraction of Sanders-endorsed candidates went on to victory than those endorsed by other celebrity politicians. The trick is selling your ideas to the nonideological pragmatists. So, Brown’s success is no surprise. (Neither is Jeremy Corbyn’s popularity in the UK, which came as a complete shock to the chattering classes.) Leftist policies can be sold to the masses provided they are marketed in the right way. Messaging matters a lot. Most people’s votes are primarily motivated by emotions, not rational analysis. (If it was the latter, not just left-of-center but radical-left politics would already have prevailed pretty much worldwide.) Fans of reason and logic (myself amongst them) might find that frustrating, but that’s just the way the world is. To prevail and actually have a chance of changing the world, we must prevail in the ugly, imperfect world that actually is—not in some hypothetical alternate world that might possibly some day exist. Appeal to people’s emotions in the right way, and you have a fair shake at persuading them. Rub them the wrong way and it matters not how solid your logic is nor how firmly grounded in facts you are: you will lose. 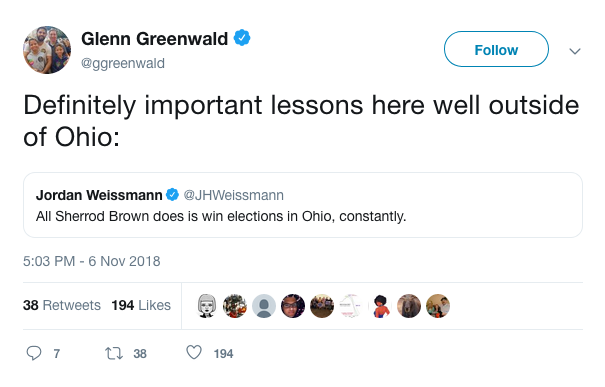 Summing things up so far, Brown’s success is no surprise to me, and neither is Greenwald’s endorsement of Brown. 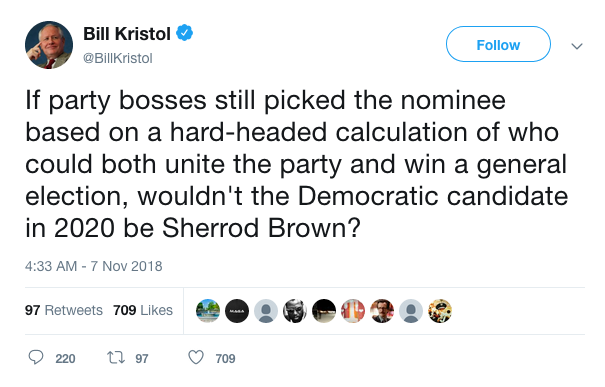 What is a surprise is Bill Kristol’s endorsement. It comes not from some nonideological pragmatist but from a lifelong movement conservative, someone whose own emotions are strongly biased towards counseling the Democrats to run rightward. That latter fact is, I think, highly significant. In Sherrod Brown, evidence seems to indicate we have an individual who is not only by any objective measure on the left of his party (and thus at the left of what is presently achievable via electoral politics), but also someone uniquely well-talented in the art of marketing himself politically. So well talented that he’s apparently managed to persuade not just many nonideological pragmatists, but an ideological adversary. None of this means that a Brown presidency would make Establishment politics stop being Establishment politics. Of course it wouldn’t; revolutionary politics is still important. It’s just that there isn’t really much of the latter in the USA at the moment—and what there is, is more an inward-looking subculture than a movement. Trumpism needs to be dethroned as soon as possible, using whatever means are presently up to the task. Like it or not, that probably means replacing Trump with a Democrat via the mechanism of electoral politics. Brown should be encouraged to run for president. If he chooses to run, the Democrats would be the biggest fools in the history of American politics if they didn’t run him against Trump. Will the Democrats Become a Party of Principle? The Democratic Party has not in my adult life been a party of principle. It has been a party of compromise, a victim of a sort of institutional Stockholm syndrome. It once was a party of principle, during the New Deal and Great Society eras, but I was only a young child during the latter (preschool age) so of course politics was beyond my comprehension at the time. By contrast, the Republicans have been the party of principle: unafraid to plainly state what they want, stick to the message, and unabashedly pursue it. That is, they were until Donald Trump came along. Then most of their old principles got thrown out the window and replaced with the fascist principle of complete devotion to the leader. The prior state of affairs always really annoyed me. I often said that the GOP was the only party of principle, but unfortunately its principles were generally repugnant to me, so I was stuck with the party of compromise. That was bad enough when it caused the decades-long erosion of the working and middle classes at the expense of the rich. Now the crises has reached an entirely different level: compromise with fascism will be vastly more tragic than compromise with conservatism. Ironically, now is the time for a measure of compromise with conservatism of the never-Trump variety, provided those conservatives are willing to reciprocate. It took a Popular Front in the form of an alliance between the UK, the USA, and the USSR to defeat fascism. My guess is it will take another Popular Front to do so today to defeat Trumpism. But I digress. To reiterate, we simply can not afford any compromise with Trumpist fascism. Nancy Pelosi probably did for political reasons have to give her “We’re hopeful we can work with them, but we will be exercising our power of oversight” speech today. Well, that game is now up. Trump let it be known in no uncertain terms that anything other than total submission to his will is utterly unacceptable to him. It is the standard position of any fascist leader, after all. There is simply no reasonable response to such an attitude except political warfare. Is the party of compromise capable of rising to the occasion? I certainly hope so, but given its history I have my doubts. It is here that the never-Trump conservative wing of the opposition might prove a useful asset. As refugees from the old GOP, they have experience in the realm of principles and standing by them, experience that most Democrats lack. Encouragingly, David Frum has already penned an excellent editorial basically calling for such political warfare against Trump. Can the Democrats rise to the occasion? We shall soon see. For all our sake, I certainly hope they will. What happened today is basically what the polls were in aggregate saying would happen: the Republicans kept the Senate and the Democrats took the house. The projected number of House seats that flipped is still (even as more are getting settled) right around the number of 35 that the polls had converged on in the past fortnight. A lot of my friends are expressing disappointment and saying otherwise. That’s more their fault than the pollsters’. A cherry-picked subset of rosy outlooks (what many of them were going on) is not representative of the overall data set. The anomaly that happened in 2016 when the polls failed to predict the Trump win seems more and more likely to have been a one-off anomaly. For a horrifying hour or so, it appeared that might not be the case. The earliest results had the Democrats doing significantly worse than forecast. Thankfully, those districts in the Eastern US (then the only time zone where polls had closed and results were available) were themselves an unrepresentative sample. As to what happens now, caution is advised. Remember my recent post about refusing to accept or honor election results. That hasn’t happened so far. But wait a bit; there’s no telling what Trump or Fox News might say in the coming days and weeks. Even Evan McMullin (a conservative, not a leftist like yours truly) is predicting things are likely to get ugly.